Plastic Man #1 cover by Aaron Lopresti. By Zack Quaintance — Plastic Man has gotten much run lately in the DC Universe, first as part of the uber event Dark Nights Metal and next as a member of The Terrifics, a Fantastic Four homage and standout title from DC’s New Age of Heroes line. Now, he’s starring in a 6-issue Plastic Man mini series by Gail Simone, Adriana Melo, Kelly Fitzpatrick, and Simon Bowland. 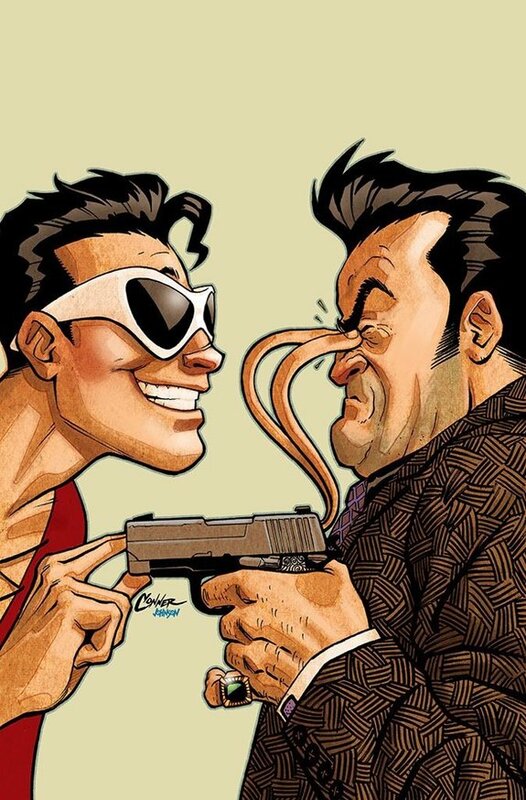 Like Plastic Man himself, issue #1 is madcap and tense to the point of straining, yet it never breaks, resulting in an entertaining superhero comic that lends a different and refreshing voice to the DCU. On a craft level, this book is incredibly well done. Simone is a veteran with all-time great runs to her name, and while this is my first exposure to Melo, her visuals cohere quite well with the script, which excels at building flourishes around fundamentals. In almost all Simone’s #1 issues, she wastes little time having both hero and villain introduce themselves, be it via dialogue or narration, but she also leaves room between exposition for killer writing, like: Cole City. A city where commerce takes place in the alleys and gutters. But not without a certain style… That’s an A+ opener. Melo and Fitzpatrick’s art, meanwhile, gives Plastic Man #1 a timelessness similar to that of the character. The setting could be anywhere from the 1930s up to modern times. I don’t think Plastic Man himself is really certain, which brings me to the story’s greatest strength: it’s unreliable narrator. This book features the comic equivalent of what fiction writers call close first-person narration, and as such, it seems like Plastic Man’s own disorientation about his origin is influencing the story. It really works. Humor is, of course, inherent to a hero called Plastic Man, yet he's not quite as self-aware or meta as characters like Deadpool or Harley Quinn, which is nice. His humor functions within the plot. Not all the jokes landed for me (humor is risky in comics), but I appreciated what the script was trying to do at all times. How far will Plastic Man stretch seems to be the metaphorical question at the heart of this series. Basically, Plastic Man #1 features big personality and a set of loosely-defined boundaries. It’s a special type of superhero comic dealing in dark contrasts, featuring one panel where the narrator tells readers, They’re my best friends in the world...as said best friends whack him in the face with a baseball bat. His signature humor seems to be hiding great pain and darkness. Perhaps it’s fitting then that Plas himself says at one point, I’m not entirely sure how far I stretch. Before I snap, I mean. Wanna see? Let’s! He may as well be asking us.